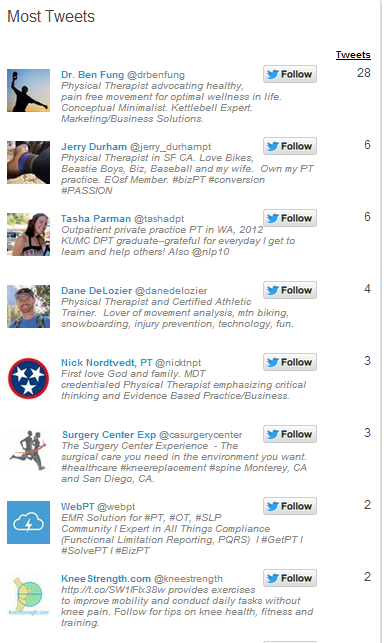 Last week's #brandPTchallenge was the topic of #kneepain. While not as popular as last week's #neckpain, addressing #kneepain was very important because those of you who have accepted the #brandPTchallenge have organically begun to reach out to other users mentioning & hashtagging #kneepain. Another quick note for those of you social media marketing nerds (like myself); Twitter is the place for new connections; an environment where politely stalking is just another way of making eye contact - just before you say "hello" in person. Also, a trend in G+ has shown that the environment is far more visual than written, almost a blend of Twitter, Facebook, and Instagram... the best way to utilize Google+ is that type of area... however, this arena is still maturing. Additionally, Facebook has been and seemingly always will remain a place where people connect with people they already know - OR - have found a page/topic of common interest for open forum. Focus on #ShoulderPain (quite a popular topic) and GO TO THE CONSUMER! Find the hashtags, the patient blogs, the consumer forums... find these places and make yourself known - and most importantly - share with your fellow PT's where our presence is needed!! Make connection with the social media users whose lives are affected by #ShoulderPain - AND - gather other PT's to demonstrate goodwill to these people who could very well benefit from our help. Note: This week's challenge will continue the momentum of utilizing hashtags in social media to brand, reach out, and interact with other social media users. Additionally, this week's challenge begins a group, market survey to discern where our presence is most needed online. In a very dynamic #solvePT chat last week, Tracy Sher MPT, CSCS (@PelvicGuru1) was one of the first to demonstrate her concentrated involvement in online forums and groups for her speciality. It is high time physical therapists follow her lead en masse to best #brandPT and help our communities! Next month, our focus will expand beyond reaching out - our focus will turn to becoming part of the already active communities of discussions online.